These notes are based on the course of lectures I gave at Harvard in the fall of 1964. They constitute a self-contained account of vector bundles and K-theory assuming only the rudiments of point-set topology and linear algebra. One of the features of the treatment is that no use is made of ordinary homology or cohomology theory. 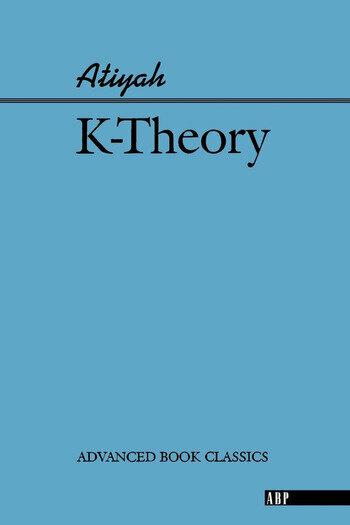 In fact, rational cohomology is defined in terms of K-theory.The theory is taken as far as the solution of the Hopf invariant problem and a start is mode on the J-homomorphism. In addition to the lecture notes proper, two papers of mine published since 1964 have been reproduced at the end. The first, dealing with operations, is a natural supplement to the material in Chapter III. It provides an alternative approach to operations which is less slick but more fundamental than the Grothendieck method of Chapter III, and it relates operations and filtration. Actually, the lectures deal with compact spaces, not cell-complexes, and so the skeleton-filtration does not figure in the notes. The second paper provides a new approach to K-theory and so fills an obvious gap in the lecture notes.